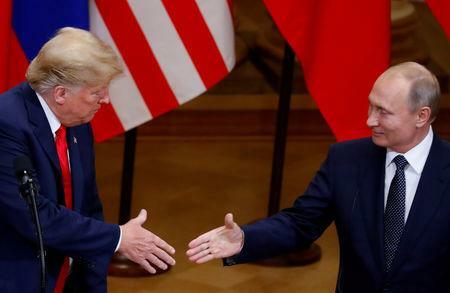 (Reuters) - Special Counsel Robert Mueller and other U.S. prosecutors have been investigating whether President Donald Trump's 2016 campaign conspired with Russia. Trump and Moscow have denied any collusion. Mueller handed in the keenly awaited report on his probe, the Justice Department said on Friday. U.S. intelligence agencies have concluded Russia interfered in the presidential election with a campaign of hacking and propaganda to sow discord in the United States and damage the Republican Trump's Democratic opponent Hillary Clinton. Russia denies it. Here are some key interactions between Trump advisors and Russian figures that have been unearthed by Mueller's probe and investigations in Congress. Several top Trump aides, including campaign chairman Paul Manafort, son-in-law Jared Kushner and son Donald Trump Jr., met in June 2016 at Trump Tower in New York with a Russian lawyer who had offered damaging information about Democratic presidential candidate Hillary Clinton. U.S. prosecutors said the lawyer, Natalia Veselnitskaya, was an agent for the Kremlin. The meeting was arranged by Rob Goldstone, a British music publicist. Participants in the meeting said nothing improper occurred and that Veselnitskaya discussed U.S. sanctions on Russia and adoption policy, not election issues. The president said he did not know about the meeting beforehand. Trump's former personal lawyer, Michael Cohen, said he pursued a deal to build a Trump-branded skyscraper in Moscow until June 2016, after Trump had clinched the Republican presidential nomination. Cohen said in a guilty plea that he spoke with an assistant to Russian President Vladimir Putin's press secretary in January of that year and briefed Trump on the project more than three times. Trump's lawyer, Rudy Giuliani, said the Moscow skyscraper talks continued until Trump won the November 2016 election but later said he misspoke. Trump, who repeatedly said during the campaign that he had no contacts with Russia, said after Cohen's guilty plea in November 2018 there was nothing wrong with pursuing the deal. Trump campaign adviser George Papadopoulos worked between March 2016 and August 2016 to set up a meeting with Russian leadership, according to prosecutors. They said a London-based professor with ties to the Russian government told him in April 2016 that Moscow had compromising information on Clinton. Papadopoulos served 14 days in prison after pleading guilty to lying to the FBI about those efforts. Manafort shared election campaign polling data in August 2016 with Konstantin Kilimnik, a former business partner who Mueller has described as having ties to Russian intelligence, according to a court filing inadvertently made public by Manafort's lawyers. The two also discussed a plan to resolve the conflict in Ukraine, a major Kremlin foreign policy goal as it seeks relief from U.S. economic sanctions, according to court filings. Manafort, a veteran Republican political consultant who earned million of dollars working for pro-Russian politicians in Ukraine, also offered private briefings about the campaign to Russian billionaire Oleg Deripaska, who is close to Putin, in an effort to collect past debts, according to the Washington Post. Roger Stone, a veteran Republican political consultant who has worked on and off with Trump for decades, shared with Trump campaign officials advance knowledge he had of a plan by the WikiLeaks website to release emails stolen from the Clinton campaign by Russians, prosecutors said. The charging document mentions that a senior Trump campaign official "was directed to contact Stone about any additional releases and what other damaging information" WikiLeaks had about the Clinton campaign, raising the possibility Trump himself made the request. Stone pleaded not guilty to lying to Congress and witness tampering. Several Trump advisers met with Russia's ambassador to the United States, Sergei Kislyak, before Trump became president. They included: Michael Flynn, who served as Trump's first White House national security advisor. Flynn has pleaded guilty to lying to the FBI about his communications with Kislyak in December 2017, after Trump won the election but before he took office. During those calls, according to the indictment, Flynn discussed U.S. sanctions against Russia and asked Kislyak to help delay a U.N. vote seen as damaging to Israel, a move that ran counter to the policies of then-President Barack Obama, a Democrat. Jeff Sessions, a Republican U.S. senator serving as a campaign adviser who Trump later named attorney general, said he met with Kislyak at least twice in 2016 after initially telling Congress he was unaware of any communications between the campaign and Russia. As attorney general, Sessions recused himself from oversight of the Russia investigation, drawing the ire of Trump. The recusal by Sessions left Rod Rosenstein, the No. 2 Justice Department official, with oversight over the probe, which at the time was headed by the FBI. After Trump fired FBI Director James Comey in May 2017, Rosenstein appointed Mueller as special counsel to take over the probe. Kushner said he asked Kislyak if he could set up a secure communications channel at the Russian Embassy after Trump won the election. Kushner also said he met with Sergei Gorkov, the head of Russian state-owned bank, Vnesheconombank, during that period at Kislyak's insistence. Vnesheconombank has been subject to U.S. economic sanctions since mid-2014.